My name is Erin, and I’m here to keep you company during your stay with us. I do hope it is an enjoyable one! You don’t have to feed me or change my water. The housekeeping staff will take care of all that. All you have to do is have a great time while you are here. And perhaps talk to me every once in a while. I think I can handle this. 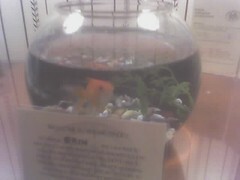 Erin seems to be a very cool fish and she/he seems to have a nice bowl to swim around in. If Jack was here with me, he would be enjoying this. The picture I took with my cell phone is pretty lousy, but you get the idea. Seattle seems to be a neat city. We had a fantastic dinner at a place called The Brooklyn. I can’t say more because it’s dark out and we didn’t have much time to take in the scenery. One thing that I’ve discovered, however, is that they have streets with hills similar to San Francisco. I wanted to bring a camera along with me on the trip but I forgot. I might be able to borrow some pictures from my friend, Dustin, or I might just use my crappy cell phone camera. I will also note that the hotel has provided me with not one, but two bath robes – one of which has a leopard skin pattern. This was not a good move on my part. In my defense, I had no idea Target rolled out the big guns at these events. Now I know and I won’t miss one again. On a side note, if you’re into community service, Target announced they’re going to increase the amount they give to the community from $2 million a week to $3 million. I work for a very cool company. OK. I know this is slightly disgusting but I need a sanity check here. Is it now ok to clip your nails at work? In your cube?? Did I miss the memo on this? At my current assignment, I sit right next to three different people that clip their nails in their cubes. Not in the bathroom or outside, but right in their cubes. When did this become acceptable? Or am I going overboard here?